My Money’s On Jeremy Cameron For The Coleman. 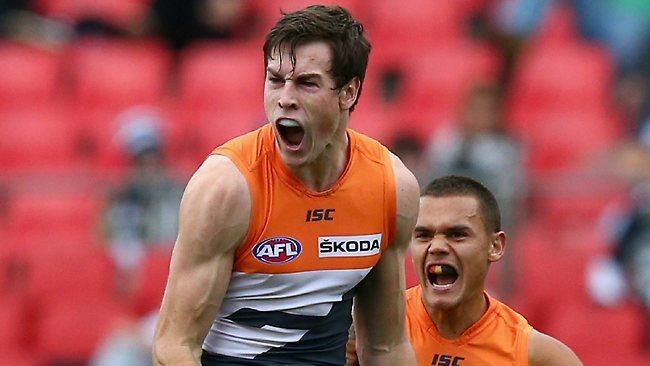 Last year, when I was watching one of GWS’ first games, I told the boyfriend that I loved Jeremy Cameron – he was my new favourite player (and if you were reading my blog back then, you know that this is truer than true). A fight broke out in the household because he disagreed with me (“He won’t get a game next year,” was what was said, if I remember correctly). I lost my bid for Jeremy Cameron for Rising Star (HE WAS ROBBED) despite my campaigning efforts. But now look: he’s leading the Coleman. How amazing would it be if he won? And his parents – Did you see Richo interview them during Round 19? Flawless. – will be fantastic to see again. So I’m just putting it out there: Jeremy Cameron can, and will win the Coleman this year. ← The AFL Wants To Learn From The NFL: Great Idea.